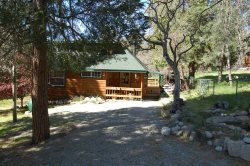 Grandma Ann s Cabin is perfectly located in Fern Valley just 1.1 miles from the heart of Idyllwild. Grandma Ann's Cabin is a perfect cabin for family gatherings, or just a few couples who want to get away from it all. Outside there is a covered front porch that is the perfect place for you to enjoy your morning coffee or a glass of wine in the evenings while enjoying the beautiful wooded view. Also in the front yard is a really cool "old school" tire swing for your little ones. Reminds me of being on the farm at my grandmas house when I was a kid. :) Don't be surprised if you see lots of little critters running around in the yard. Chipmunks, squirrels, more birds than you can count, and possibly some deer. :) Inside on the main level, there is a full bathroom and large bedroom with queen bed. Also on this level is a formal dining room, good size living room, kitchen dining table, and a giant kitchen, complete with all the comforts of home. And wait till you see the neatest vintage fridge in the kitchen. The living room has lots of books and games for the family and big comfy couches that are perfect for snuggling up to watch a movie or read a good book. Down a few stairs to the lower split-level, is a large bedroom with queen bed and wood burning stove and seating to snuggle up on to enjoy the fire. On the upper level, there are two giant rooms and a very large full bath. One room has a double/twin bunk bed and a couch that folds out. The other room has 1 twin and a queen bed. This is a wonderful home and you will surely enjoy your stay here.